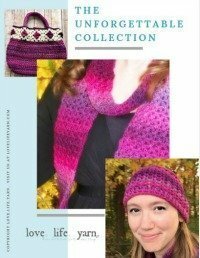 Free Knitting Pattern - Unforgettable One Skein Scarf - love. life. yarn. I have had a crochet version of this scarf for almost three years and have been asked many times to create a knit version of the Unforgettable One-Skein Scarf, so I finally did! This simple four row repeat is great for practicing your decreasing and yarn overs and creates a nice mesh pattern that is similar to the V-stitch crochet version. I really like how this turned out and enjoyed wearing it to the 2016 Knit and Crochet Show in Charleston, SC last weekend. You can easily create a regular scarf with or without fringe or an infinity scarf – the choice is up to you! Buy a large print, ad-free version of this pattern for $1.99 at my Etsy shop. K2tog (knit 2 together) – insert right needle from front to back (knitwise) into next 2 sts on left needle. Wrap yarn around (just like a regular knit st) and pull it through. Row 3: K3, *yo, k2tog; rep to last 2 sts, k2. Row 4: K2, purl to last 2 sts, k2. Row 5: K2, *ssk, yo; rep to last 3 sts, k 3. Row 6: K2, purl to last 2 sts, k2. Repeat rows 3-6 until desired length or almost out of yarn, then knit 2 rows. That’s it! 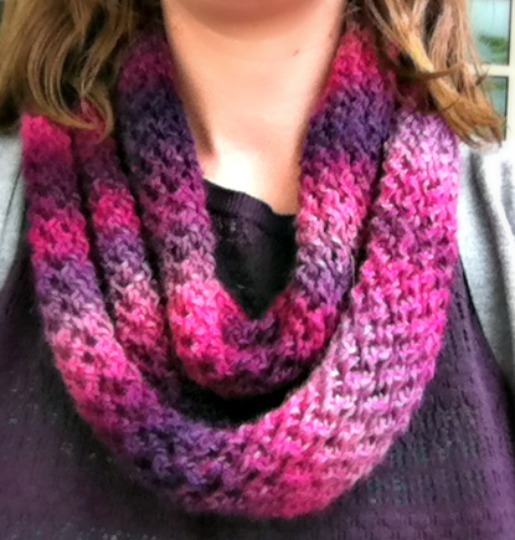 If you would like an infinity scarf like I did, just stitch the 2 edges together. If you would like to leave it open, feel free – the garter st on the ends helps with curling and gives it a nice edge. I would definitely recommend blocking this, too – it helped mine not curl as much. **Please note that this is the correct pattern above. The k2 in row 5 was changed to k3, which is correct. Help! I have a problem. I’ve started knitting this and on row 5, if you begin with a knit 2, you end up with a knit 3 at the end instead of a knit 2. UNLESS I am supposed to knit 3 at the beginning like I do on row 3. Please tell me what to do. Thanks! Hi Melissa – it is supposed to be k3 at the end of row 3. I am going to change the pattern to reflect that. Thanks for letting me know! Rows 3 and 5 are a 2 stitch repeat with one extra knit stitch to make it an odd number and give it the lacy pattern. The extra knit stitch on row 3 is at the beginning and row 5 is at the end. Sorry about that! Thank you so much, Amanda! I appreciate your quick response. Love the pattern and yarn. Now I csn get back to knitting! Many scarves curl in along the edges…Is this one of them ??? This does curl some as seen in the picture, but the garter stitch edges help. Thank you ~Sometimes, you don’t know until after you’ve invested time, yarn, effort into it. I have knit some that really, really curl. Hi! This is sooo pretty! I’m, I guess, and “intermediate” knitter and I have a question. Almost every pattern I see that has an SSK does it differently than the last one. THIS one says slip knitwise – got that – then it says insert left needle left to right – into the fronts – welll – left to right – to me – would be into the backs of the stitches – not the fronts. Please help! Hi Jeannie! I always had a question about SSK, too. I mean, some patterns don’t even tell you if you slip knitwise or purlwise – it can get really confusing. As far as how to put the needle in, I do it the same way that is seen in this video (although I don’t knit continental and she is!) but it does help tell you how the needle goes into the stitches. Hope this helps! Hi Rose, I looked up a conversion chart and found that the closest is 10 ply. It is a worsted weight yarn in the US. 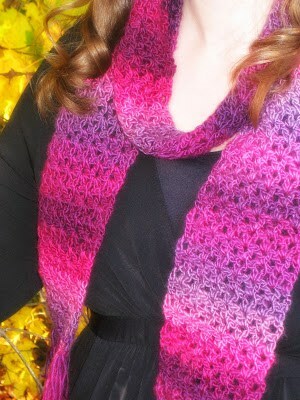 I love this scarf pattern but I would like it a little wider. How many stitches would I need to add to get the scarf about 6 inches wide? I did some math and I think 45 stitches would give you about the right width. I am on vacation so I couldn’t measure the scarf itself but I used the number of stitches versus the width. It should be just a little over six inches if you start with 45. Thank you so much. Enjoy your vacation. what do you mean by blocking the scarf to avoid curling? Have the corrections been made to the printable pattern, so when I print this it will be correct? Hi! I did change the instructions, so if you print from this post it is correct. Hi. I knitted the scarf absolutely love it. I would like to knit a floppy hat , and was wondering how the pattern worked on a circular needle? And how the stitches would work? I hope this makes since to you. do I go even or on even with the amount of stitches. I just printed this pattern and am excited to start knitting. Can I use an acrylic instead of worsted wool. I can’t wear wool next to my neck. Can I use an acrylic yarn fir this pattern. I can’t wear wool next to my skin. What do they mean with yo, ? Asking the following for my Mother who is knitting your pattern. Every row, regardless of pattern, should have a stitch count of 29 stitches once the row is complete, right?